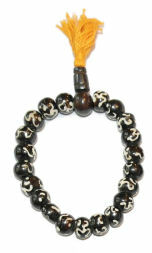 Hand painted Buffalo Bone wrist mala is Adjustable Hand made in Nepal ..
Adjustable Bodhi Seed wrist mala. Every beads is about 12mm Hand crafted in Nepal ..
22 beads of hand painted spiral bone 6 mm bone mala has adjustable string Hand made in Nepal.. 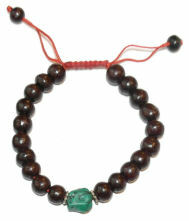 The lotus flower has a symbolic meaning which represents being pure in one's spirits.The flower produces beautiful petal even if it grew in the d..
Hand made Om written Buffalo bone wrist mala According to Tibetan Buddism "The syllable Om purifies the neurotic attachment to bliss and pride, which ..
Hand made 18 Rose wood wrist mala with semi preciouse stone Rosewood is a very special and rare wood that is considered holy and prized in Nepal and I..
13 Turquoise beads wrist mala with adjustable string. Hand made in Nepal..